Bill and Hillary Clinton are selling discount tickets on Groupon in an attempt to improve upon the feeble opening crowd they had on their speaking tour. Tickets for nine of the "Evening With the Clintons" tour stops have gone up on Groupon at heavy discounts, Fox News reports. The first stop in Toronto had "vast swathes" of empty seats, while the second stop in Houston had to be delayed because of George H.W. Bush’s funeral. Even in heavily Democratic parts of the country, the former first couple appear to be having difficulty selling people on their latest speaking tour. Phildelphia, New York, Detroit, and Boston are among the venues where tickets are available at a steep discount. Among the deals: Tickets to an April 11 talk at the Beacon Theatre in New York – normally priced $287 – are going for $145 on Monday. Tickets to an April 12 Detroit talk, originally listed for $220.70, are going for $95. And tickets in Philadelphia for an April 12 talk have been reduced from $208.20 to $85. The Groupon is apparently working: Tickets to a May 4 appearance in Inglewood, Calif., that were normally priced $77 and reduced to $35 a pop were sold out by Monday. The tour contrasts unflatteringly with Michelle Obama’s Becoming book tour, which has sold out venues and drawn the former first lady reams of positive media attention. Ticket packages for Obama’s tour have sold for as much as $3,000. The least-expensive single tickets, priced at $30, quickly sold out and are now only available at a markup through third-party sellers. 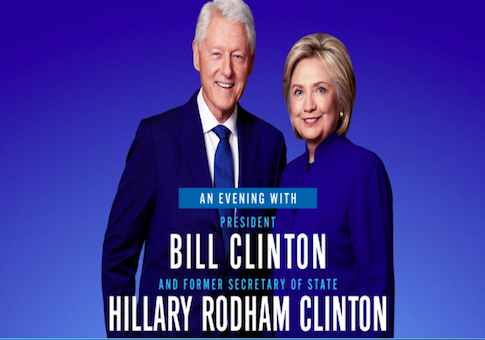 Third-party ticket sellers have listed "Evening With the Clintons" tickets for as low as $7. While the box office numbers look bad for the Clinton’s tour, it hasn’t exactly been critically acclaimed either. New York Times columnist Maureen Dowd questioned why the Clintons are even trying to bring in more money. The Clintons’ tin cup is worthy of the Smithsonian.